"He’s actually purring ... I have the feeling that he knows he’s home." A lot can change in 14 years, but some things never do — like the love shared between two old friends. In 2004, Perry Martin was living on the coast of Florida when the state was hit by Hurricane Jeanne, the deadliest storm that year. Amid the chaos and confusion, Martin lost someone very dear to him — his cherished cat, named Thomas Jr., or T-2 for short. The then-4-year-old cat had escaped from home and was nowhere to be seen. "I was devastated," Martin told The Dodo. "I looked everywhere for him. I had neighbors looking for him. I spent all of my free time just looking." As time passed with still no sight of T-2, Martin resigned himself to the notion that his cat was really gone forever. More than a decade had passed since then, but Martin never forgot about his beloved pet, whom he never tried to replace with another cat. He knew that even if T-2 had managed to survive the aftermath of the storm, he'd be well into his golden years at age 18. For Martin, that seemed unlikely. "I was sure he must have passed away," he said. But then, just last week, Martin got a call he never expected. It was from his cat's old veterinarian. 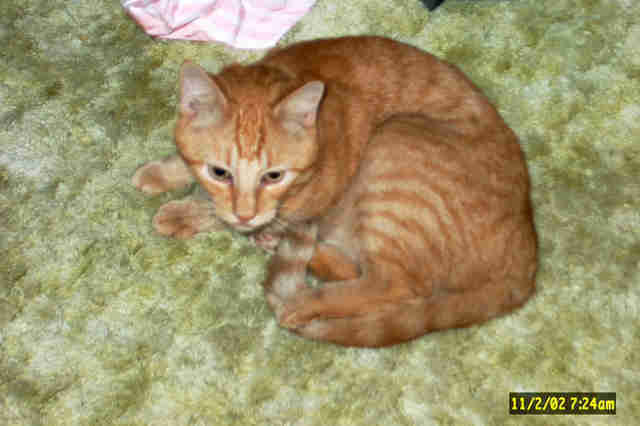 A stray cat had been rescued from the streets, and he had a microchip. "They said, ‘Perry, what would you say if I told you somebody found T-2?’ I said, ‘Well, I’d probably tell you that you’re crazy.' She says, ‘Well, the humane society has him. 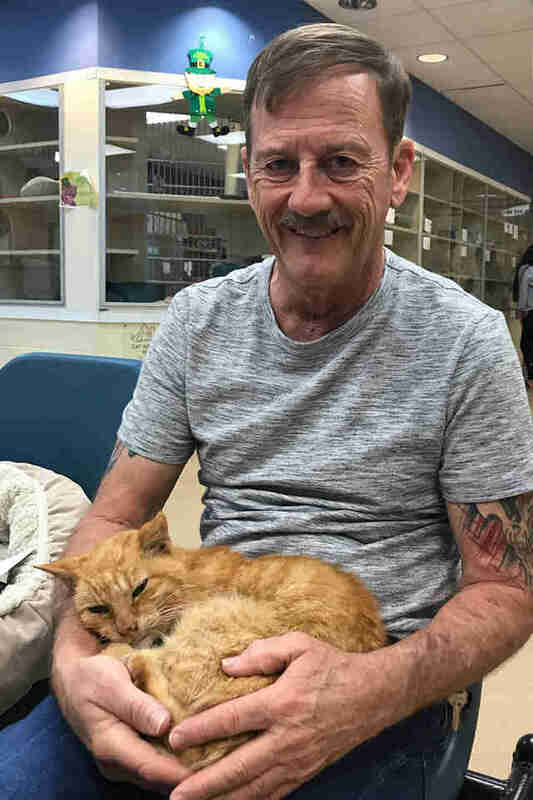 We verified it with his microchip.’"
Martin, suspecting that there had been some mistake, drove to the Humane Society of the Treasure Coast just in case. "I didn’t believe it. After 14 years?" Martin said. "But it was him. As soon as I saw his face, I knew it was him." T-2 seemed to know who Martin was, too; his old friend whom he'd become separated from 14 years earlier. Now, they were finally reunited. It's only been about a week since Martin and T-2 rejoined each other's lives — but things couldn't be better. The two old friend have lots of catching up to do, and they're not wasting any time getting started. "T-2 hasn’t left my side. He’s been sitting on my lap and following me everywhere," Martin said. "Believe it or not, he’s actually purring. I haven’t heard a cat purring for 14 years. I have the feeling that he knows he’s home." Despite being 18 years old now, and having apparently spent much of those 14 years living on the streets, T-2 is in decent health. He's a little thin and wobbly, but Martin is optimistic T-2 will recover now that he's safely back where he belongs. And Martin knows just what to thank for that — the microchip that made the reunion possible. "Get your pet microchipped. It doesn’t cost much," he said. "If you take the initiative to do that, make sure you also keep the information updated. I had moved around in the years that T-2 was gone. Update the info, even if you think they’re gone forever."